Leading fencing instruction in the Hudson-Berkshire region. Eric has been involved with the sport of fencing since the age of ten. In addition to co-owning The Phoenix Center, Eric currently works as an Assistant Coach of the Vassar College Men’s and Women’s Fencing teams. His students compete at the divisional, sectional, and national levels. Eric has completed Level 1 Foil at Coaches College and has CPR, AED and First Aid training for both children and adults. He is a nationally rated referee earning his level 6 in foil and level 5 in epee and level 8 in saber. Will is an experienced competitive fencer, coach and nationally rated referee. Will has coached at The Phoenix Center in the past and we are happy to bring him on board once again. 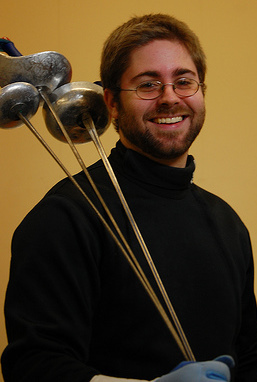 He is an A rated epee fencer and placed in the top 4 in Men’s Epee at the 2011 Div 2 National Championships. Will referee ratings are a 5 in foil and epee and a 7 in saber.